Official synopsis: "Return to the dazzling world of The Looking Glass Wars as Wonderland is fantastically brought to life again by acclaimed Hollywood producer, Frank Beddor. Alyss of Wonderland's rule has only just begun, but the Queendom and her White Imagination are already under threat. Someone has resurrected the brutal Glass Eyes, and they are attacking Wonderland on all sides. Has renegade Redd Heart freed herself and her assassin Cat from the prism of the Heart Crystal? Can Alyss trust Boarderland's King Arch, as he extends a benevolent helping hand? A battle is raging but who is the enemy?" 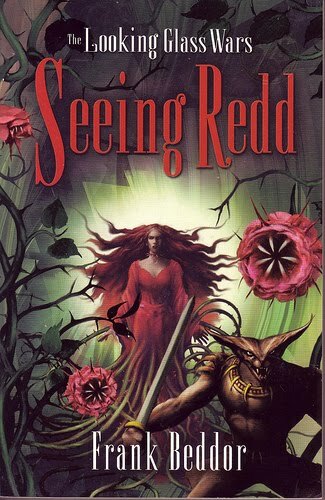 Is Redd is back, and even more evil and cunning than ever? The Queendom is in danger yet again and it's up to Alyss to do what she can to protect it. But in an ever-changing world of politics, who is the enemy and who is the ally? I loved this book even more than I loved The Looking Glass Wars, the first book in the trilogy. This one has an epic feel about it that when I was reading made it even more breath-taking. As I said in my review for The Looking Glass Wars (which can be found here) the imagination used in these books is astounding and mind-boggling. I really want to meet Frank personally and ask him just where all of it came from? He's taken Wonderland as we know and it and changed it completely that fits so superbly in this book. It's probably one of the most imaginative series I've read. The creatures. The characters. The setting. That man must be mentally exhausted once he's finished one of these books! The writing just as ever is superb and makes for a perfect, effortless read. You don't feel as if you're being carried through the story. It's more of a drifting feeling. It's so fluid and captivating that you can't help but read on until the very last page. After the stunning conclusion, I am left aching to see what happens in the third and final book in the trilogy, Arch Enemy. Luckily it's on my reading pile so I don't have too long to wait! If you haven't read these yet, do not waste a single moment. Buy them, borrow them from the library. Do whatever you can. Everyone should be exposed to this brilliance! Ooh. Will now have to look for it. And possibly reread the first one!